I previously posted some pictures of the site of the old Normanby Rum Distillery on the banks of the South Pine River at Strathpine. Here’s a picture I took today of one of the few remaining bottles of Normanyby Rum, kept safely for posterity’s sake at the Pine Rivers Heritage Museum, at Old Petrie Town (North Pine Country Markets). As a kid back in the early 70’s living in Bald Hills my mates and I used to swim across the South Pine River to poke around in the old distillery. Oh how I wish I had kept some of the dozens of old bottle labels we snuck home with. I didn’t realize the ruins of the distillery were still there in the 70’s. History isn’t that long ago, is it? With recent newspaper articles featuring Bundaberg rum in mind, I mentioned to my wife that there was rum distillery just 500 metres from where we lived in Strathpine. OMG she said. That’s where that plaque is on the walkway. The plaque seems to have wandered off BTW (now absent). Anyway, I recounted the little I could remember i.e. vague recollections of train tracks and that my father enjoyed a drop if this historic brew. Nice to find something on google to provide some details. Be nice if someone posted a photo of the factory or maybe they have already. I’ll keep looking. Thanks. 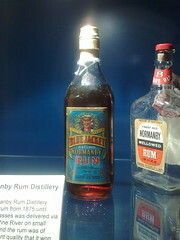 Over the weekend we moved some of Nana’s things and came across an untouched bottle of Blue Jacket Normanby Rum. Wow! That would be worth a fortune, wouldn’t it, Ben? I recall, in the early 60’s, must have been about 1965, a friend’s folk the Robinsons, had a place on the corner of Norris Road and Telegraph Road at bald Hills. One day George had to go and get a 44 gallon drum filled with Molasses at the Normandy Distillery for his father to feed to stock. I accompanied him in has father’s old Standard ute. Back then, there was a railway siding running from the Strathpine railway yards, across Gympie Road to the distillert.